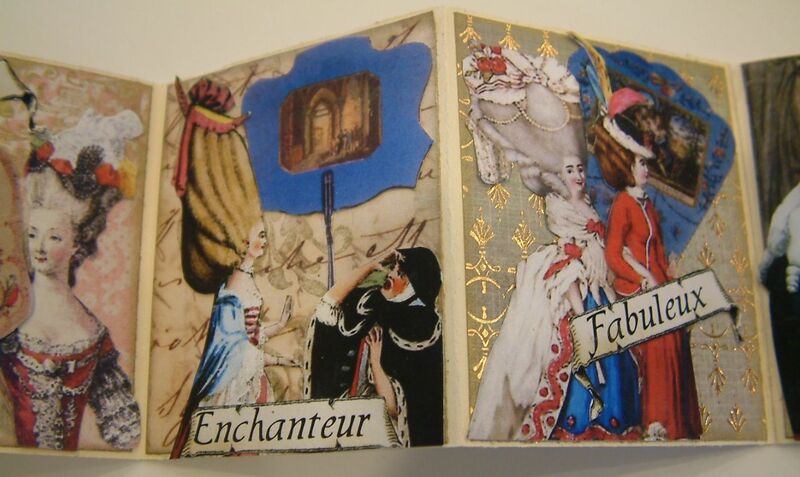 Below are the banners with French words I created for my “How’s My Hair” accordion fold book. You are welcome to download them and use them in your art. 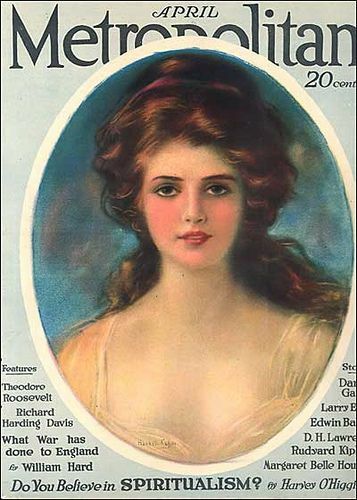 To download an image, click on the image to expand it, right-click and select Save As. 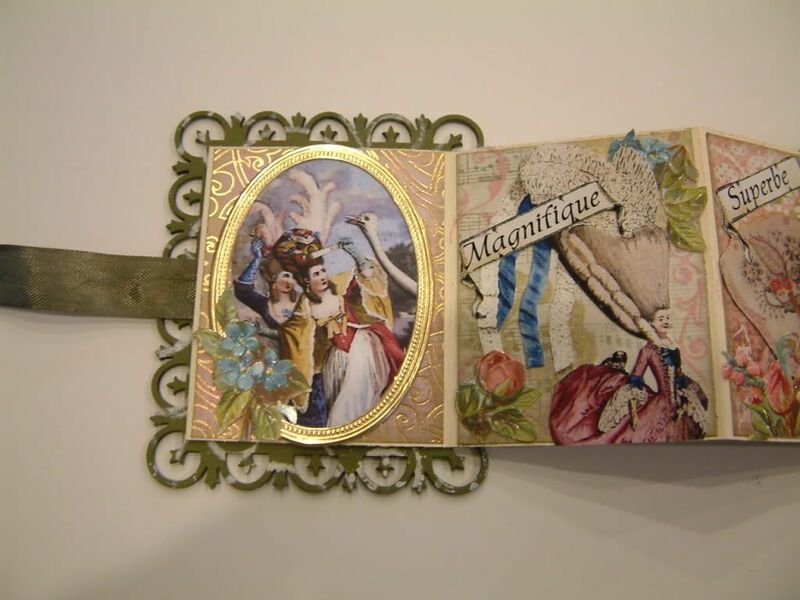 Accordion folded books are simple to make and require no sewing. Everything is assembled with glue. 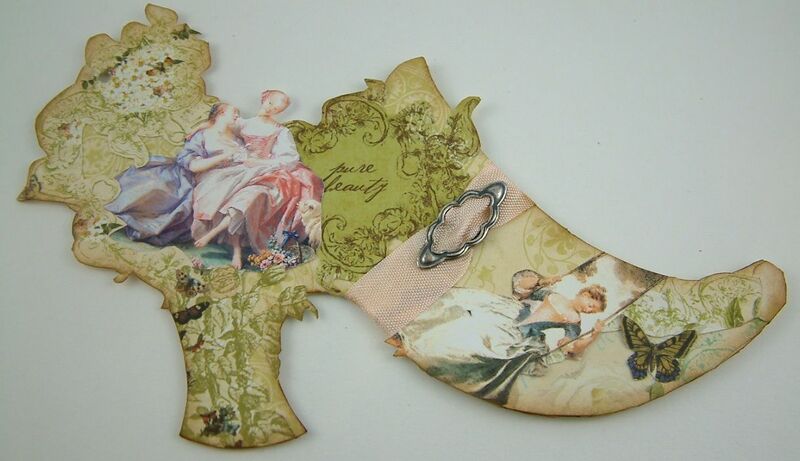 You can make them any size you want and can use them to display art, as a journal, as scrapbook or as a piece of art. 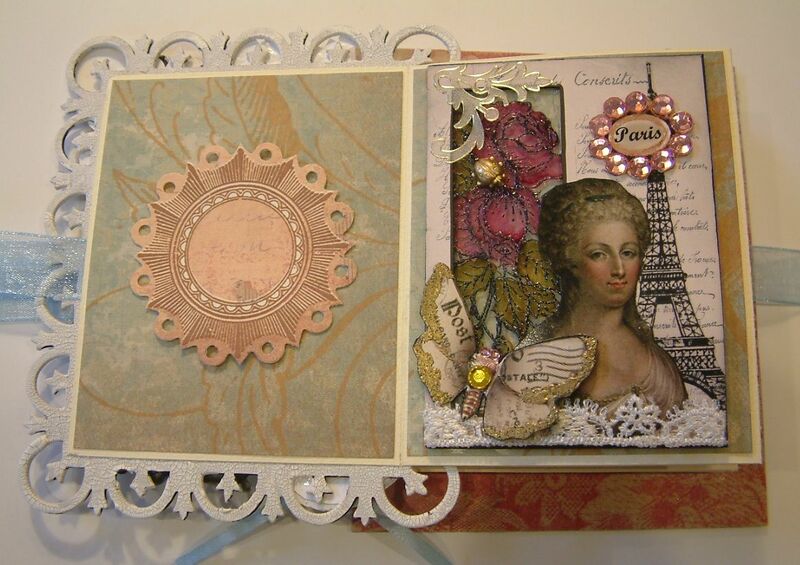 The new Rectangular Fleur de Lys Frames carried by Alpha Stamps make perfect book covers. I also thought that Alpha Stamp’s new humorous “How’s My Hair” rubber stamp set and collage sheet would make a fun topic for a book. 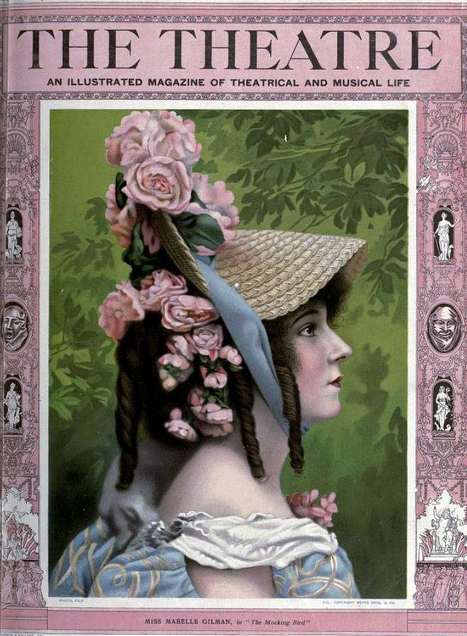 The new stamps and images are based on the craze of the French court in the 1770s (Marie Antoinette’s time) of creating huge hairstyles called “le pouf”. 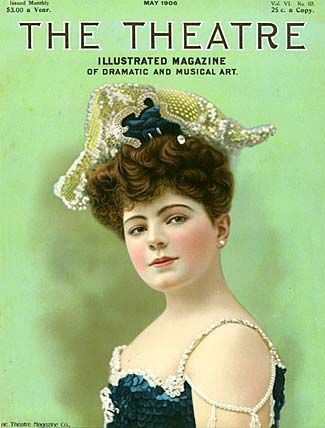 Hair dressers used cushions made of fabric or cork and the woman’s own hair as well as added hair pieces that would be combed over and piled on top of the cushions. 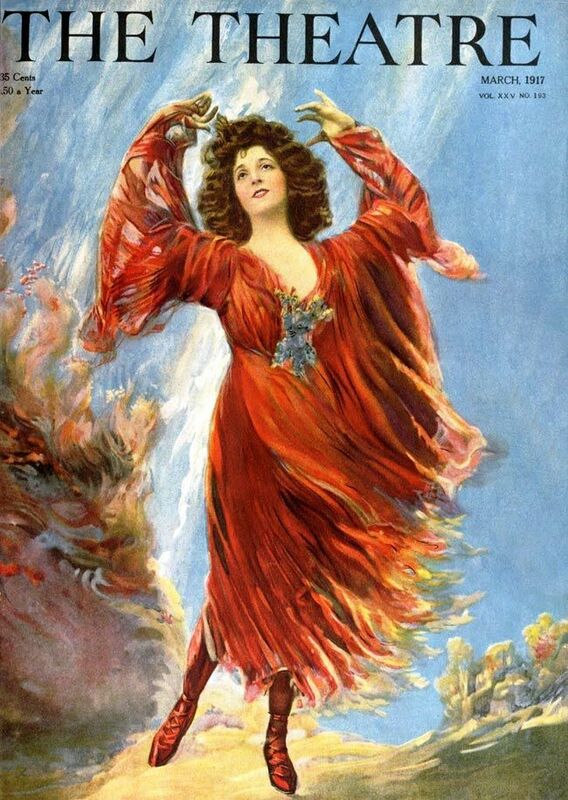 Next were added enormous curls, feathers, lace, flowers and other ornaments. The bigger the hair the higher the status! 1 Sheet of 12 x 12 Cardstock. 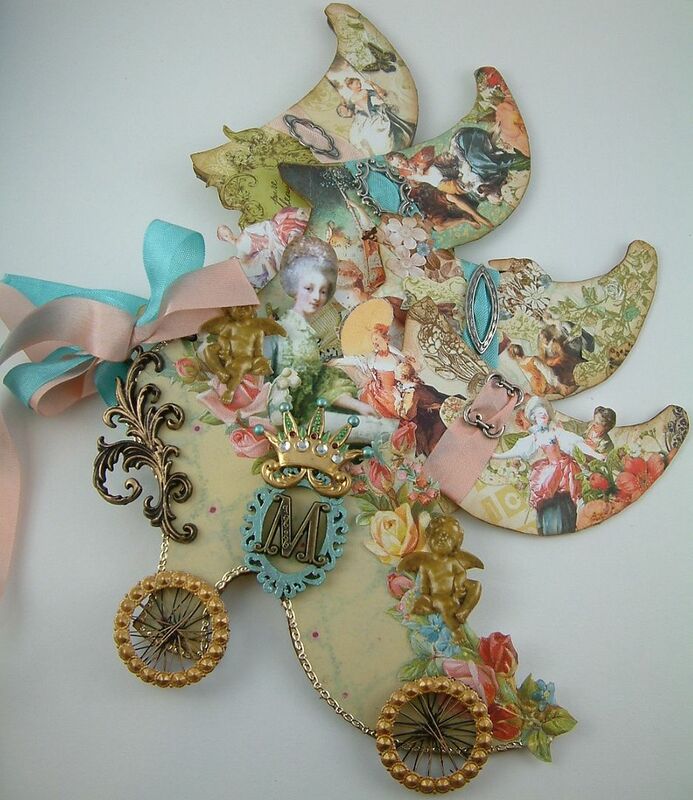 Decorative paper, embellishments and images for the covers and pages. The first step is to create the inside pages of the book. I suggest using cardstock because decorative paper usually has a white interior that is exposed when folded so your book pages may end up with a white edge. 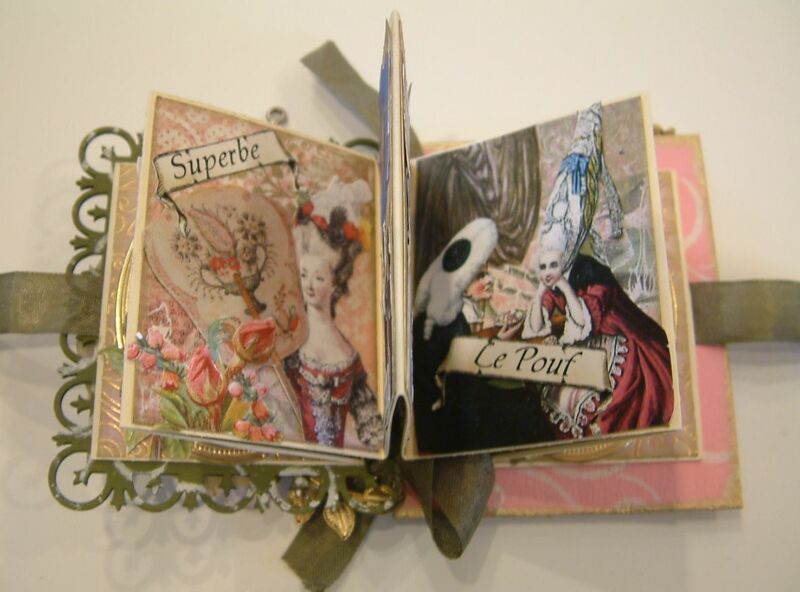 Once the pages are created you can add decorative paper, images, embellishments, etc. From a sheet of 12 x 12 cardstock cut 2 strips of paper that are 2 5/8” wide. Score the first strip of paper at intervals of 2 1/8”. You should end up with 5 score lines. Fold first strip of paper along the score lines. Score the second strip of paper at intervals of 2 1/8” creating only 3 score lines. Fold the second strip of paper along the score lines. The first strip should have 5 panels or pages and a partial page at the end. The second strip should have 3 panels or pages and a large extra piece at the end. Cut away the large extra piece at the end of the second strip along the last score line. This should leave you with 3 pages. 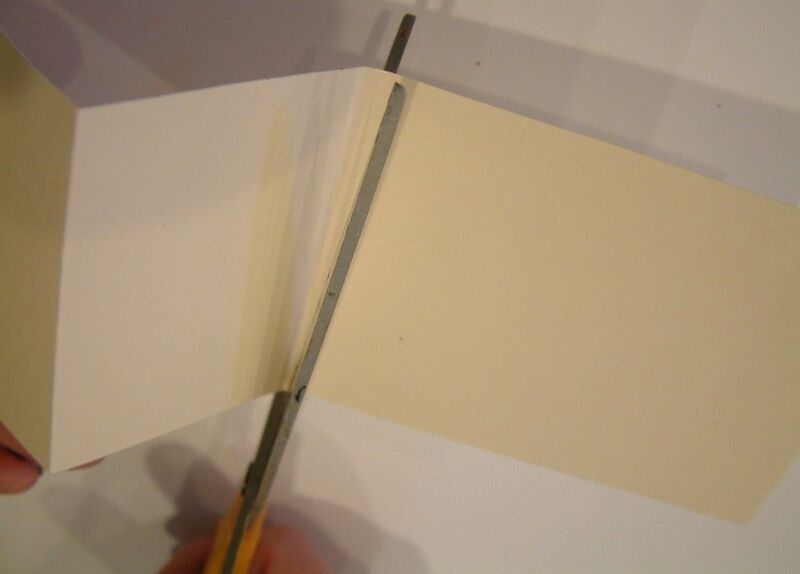 Glue the two folded strips of paper together by attaching the short page on the first strip of paper to the first page on the second strip of paper. 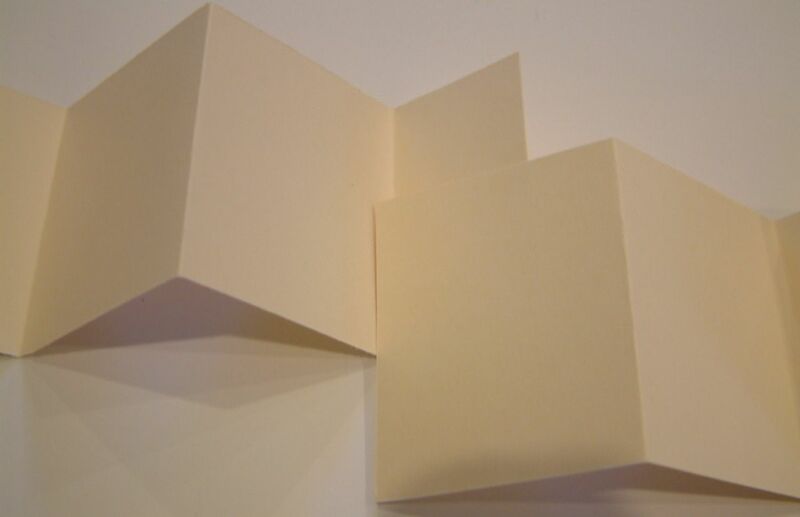 Below is a picture of how your cardstock strips should look when they are combined. There should be a continuous folded strip of paper with 8 pages. Note: This particular book has 8 pages. You can have as many pages as you would like by simply combining more strips of paper. The only rule is that you must have an even number of pages in order for the folds of the pages to attach properly to the covers. First, decorate the inside pages. You must be careful to decorate the correct side. 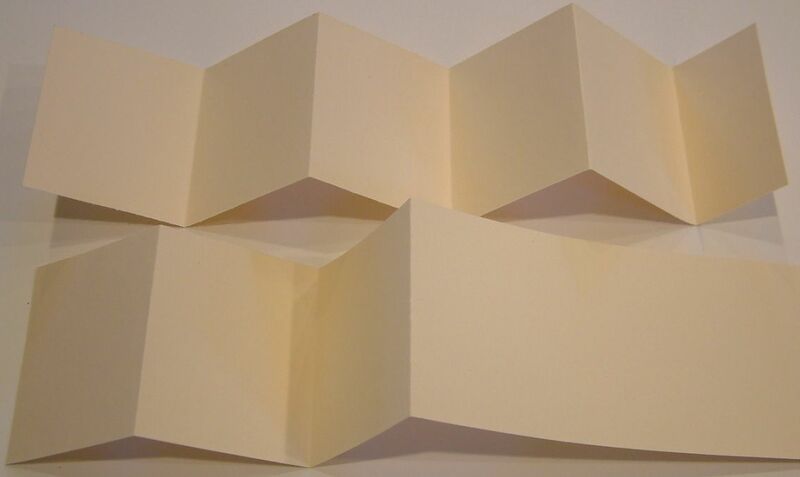 Lay the accordion folded pages in front of you. The side that is the “inside” of the book is the one where the last page on each end lays flat if you press it down to a surface without undoing the folds (see the picture below). The side that is the “outside” or back of the book is the one where the end pages don’t lay flat and form a hill with the next page (see the picture below). Also be careful to pay attention to direction when decorating both sides. You don’t want your images going one direction on the inside and another direction on the outside. I started decorating the inside pages by cutting pieces of decorative paper that I then glued to each page. I like to cut the paper slightly smaller than the page so that the cardstock acts as a frame for each page. I used papers from the Sweet Nothings Paper Pad. Before gluing the paper to the pages I stamped and edged the paper using gold ink and a rubber stamp with an image of swirls. After attaching the paper to each page I added images from the Alpha Stamps How’s My Hair and Paper Doll Fans collage sheets. I finished up with the banners of French words and flowers from the Pink Roses Dresden Scrap. The images at each end are framed with Small Dresden Oval Frames. The thing to remember about decorating your pages is not to use anything that is too bulky. When you decorate the back you can do something as simple as just adding decorative paper or you can also add images etc., it’s up to you. When decorating the outside or back don’t decorate the first and last page. The first and last pages are used to attach the accordion folded pages to the covers of the book. As you can see below, I only decorated the six pages in the middle. I decorated the back of my book with paper from the Sweet Nothings Paper Pad and Scripty Scrapbook Paper; edging and stamping the paper as I did for the front. 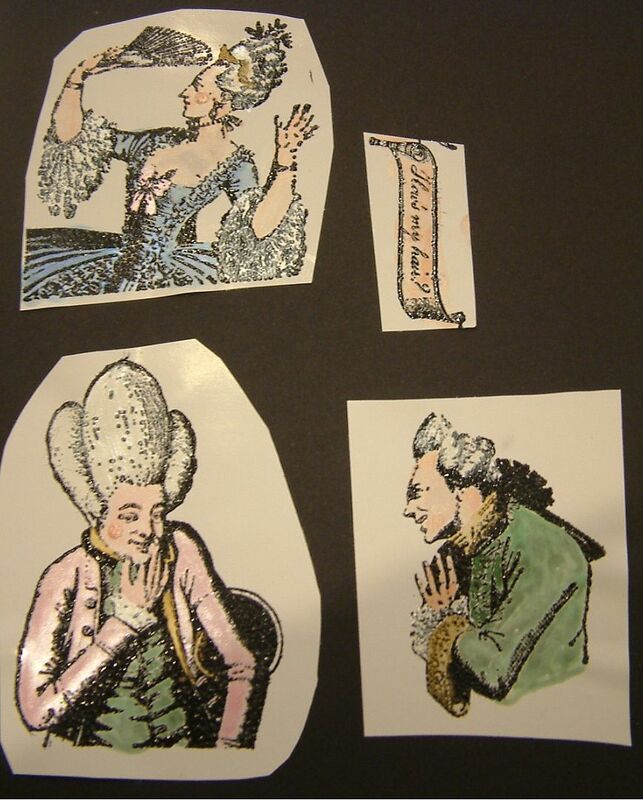 I then added images from the Alpha Stamps Fragonard’s Lovers and Stolen Moments collage sheets. Lastly I added bows and fleur de lis that I punched from the Sweet Nothings Paper Pad. 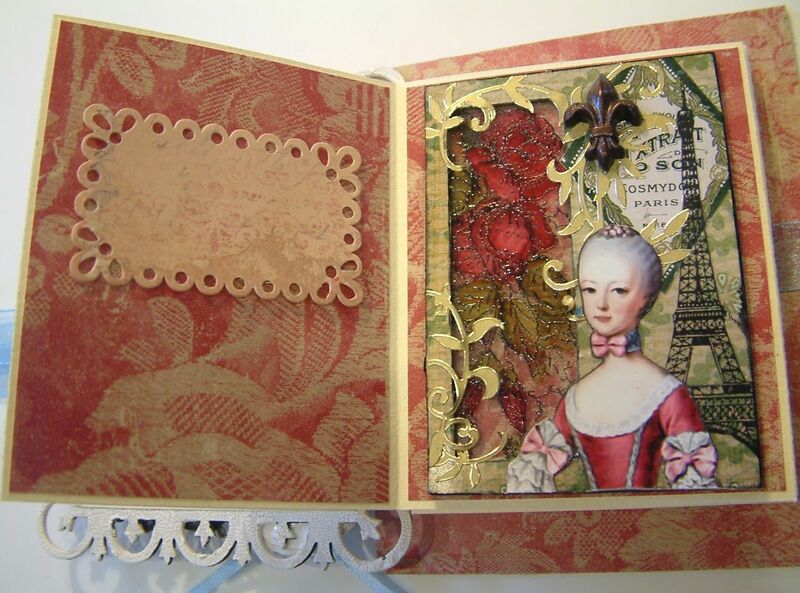 For the front book cover, I used the small Rectangular Fleur De Lys Chipboard Frame that measures 2 ¾” x 3 ¼”. 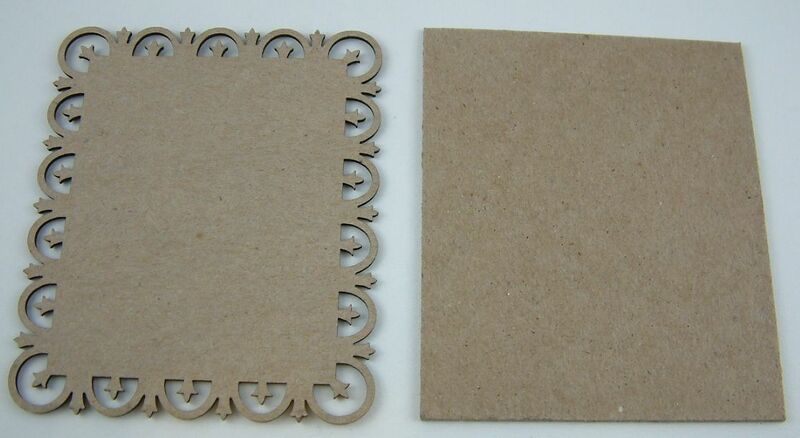 This chipboard set of frames is great for making book covers. For the back book cover I cut a 2 ¾” x 3 ¼”piece of chipboard. 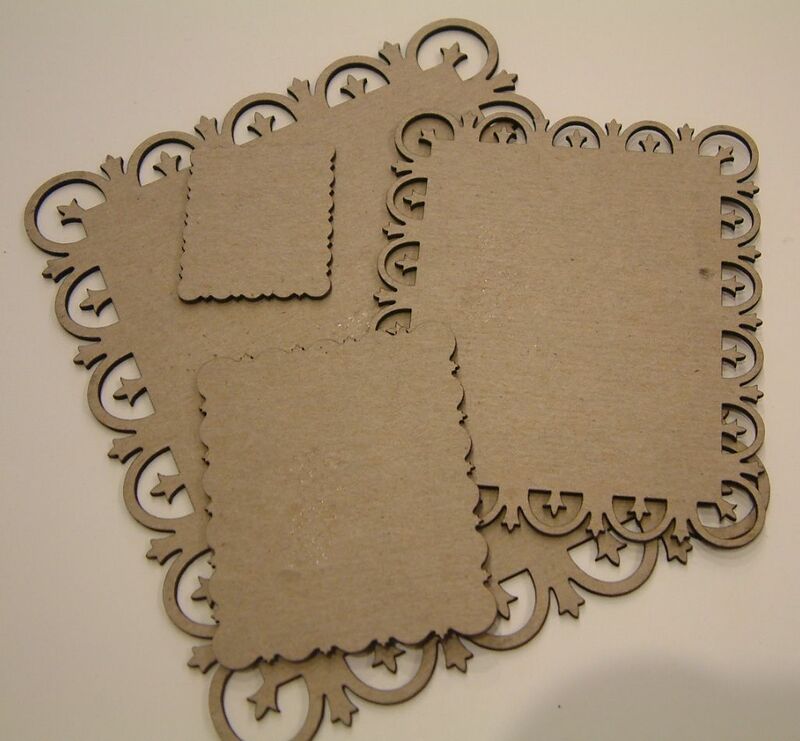 The chipboard was about the same thickness as the Fleur De Lys frame. If all you have is thin chipboard you can cut more than one piece and glue them together. I painted and stenciled the front and back covers on both sides. 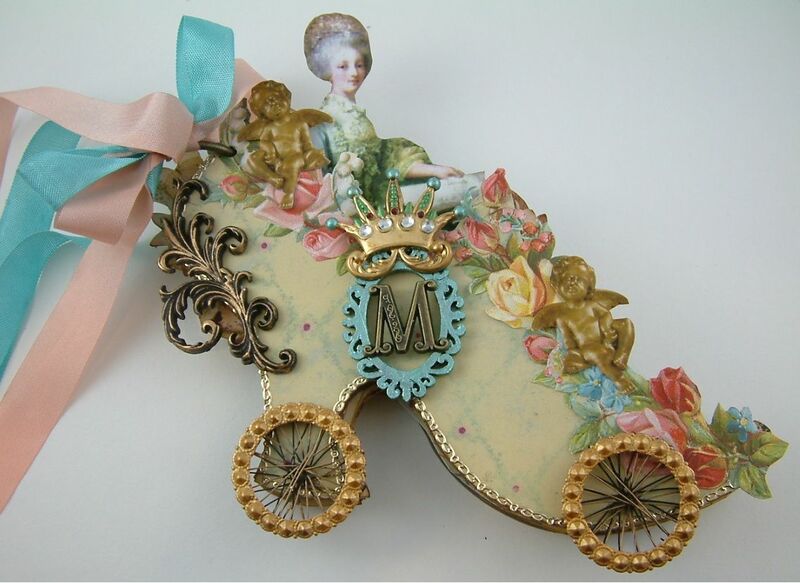 You could also add paper, ink, rub-ons or any other flat embellishment at this time. I don’t add any dimensional embellishments until after the book is assembled as it makes it hard to attach the pages to the covers. Glue a strip of ribbon to center of the backside of each cover. 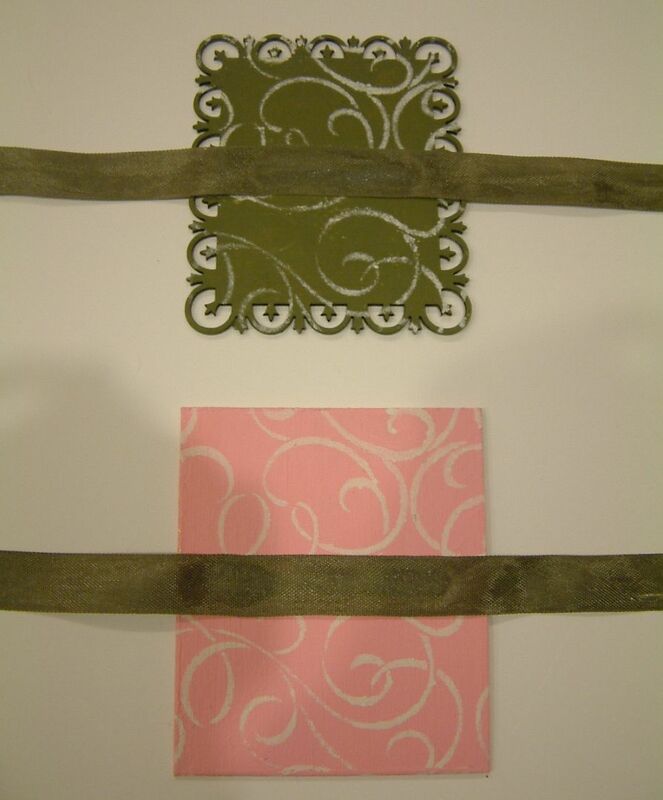 The ribbons are used to tie the book closed. For this book you will need two pieces of ribbon approximately 18” long. Use ribbon that is thin and not stiff. For this book I used Seam Binding from Alpha Stamps. The ribbon is nice and thin, feels like silk and is easy to tie. Don’t worry if the glue shows through the ribbon as the inside pages will cover the ribbon. Glue the first page of the book to the inside of the front book cover. Center the page on the cover (see below). Glue the last page to the inside of the back book cover. Center the page on the cover (see below). Now that the book is assembled you can add dimensional embellishments to the covers. The images on the front and back of my covers are from the Alpha Stamps How’s My Hair Rubber Stamp Set. The set includes 11 different images. I stamped the images on glossy paper using Black StazOn and then embossed the images using clear embossing powder. Next, I backed the stamped images with cardstock to give them more support, particularly since the image on the front of the book is attached to the outside of a frame and is not flat against the cover. I painted images with Twinkling H2O paint. I then added gold trims and rhinestones and pearls. To close the book, fold the accordion pages together and tie the ribbons together on each side of the book. you can just untie the ribbon on the right side of the book and thumb through the pages like a traditional book. 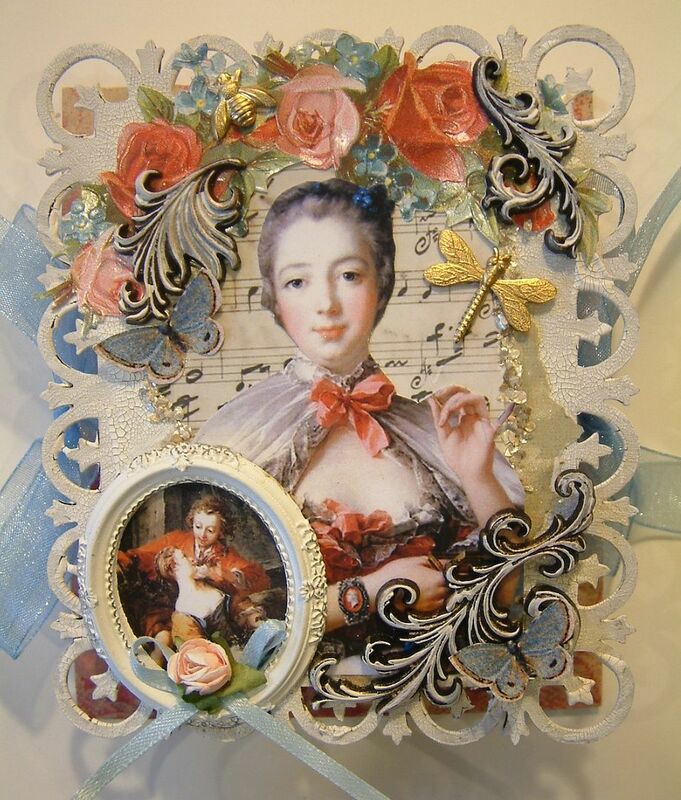 For the book below I used the larger Rectangular Fleur de Lys Frame that measures 4” x 4 3/4”. 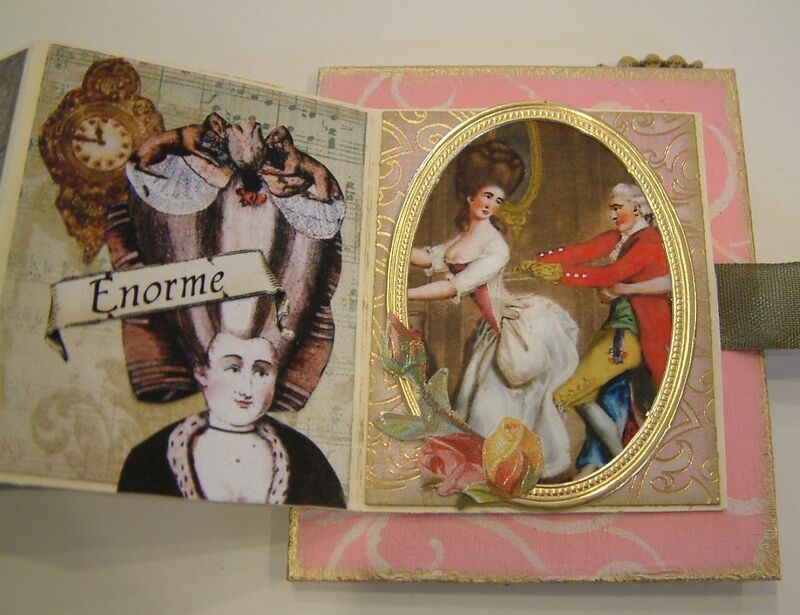 The inside pages measure 3 x 3 ¾” which makes them the perfect size to display ATCs. I like to attach the ATC to the page on the right and display information about the ATC on the left page. To attach the ATC I use a couple of small Glue Dots. I like Glue Dot’s because you can remove the ATC without damaging it or the book. All the Alpha Stamps products used in this tutorial are on sale, so click here to jump to their site and checkout the special prices. To purchase a kit to make my "How's My Hair" book and to enter a giveway for the kit click here. 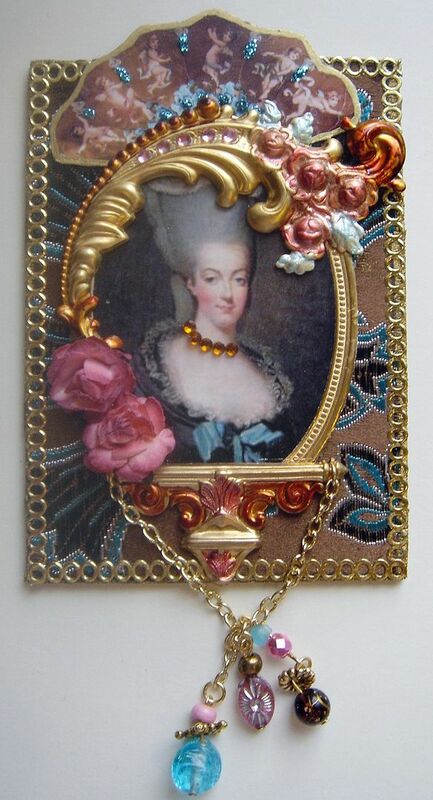 Back in December I was busy designing all kinds of Marie Antoinette Inspired art which I will be posting here over the next few weeks. 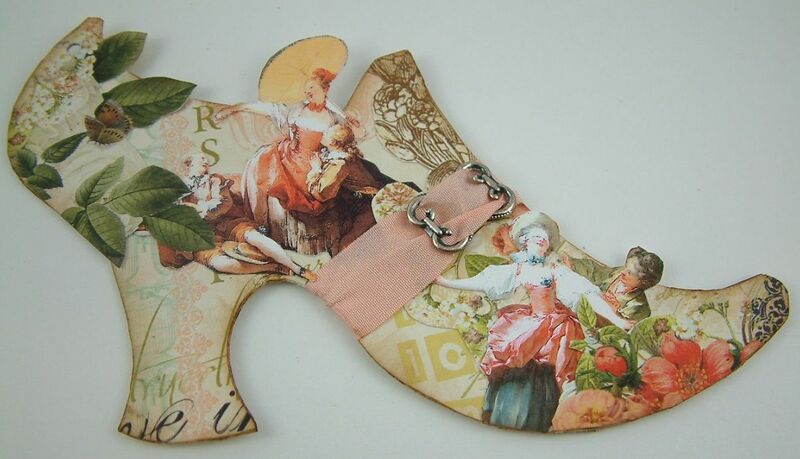 The first piece is a Marie inspired shoe book. 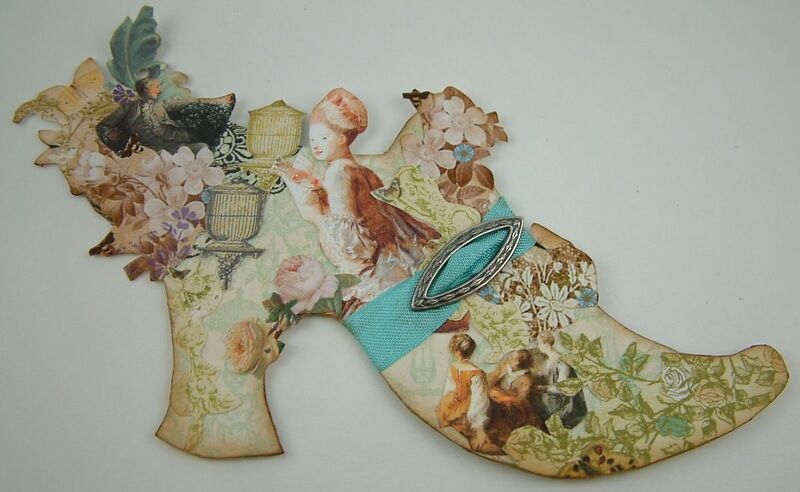 The size of the unaltered chipboard shoe is 4” x 6”. 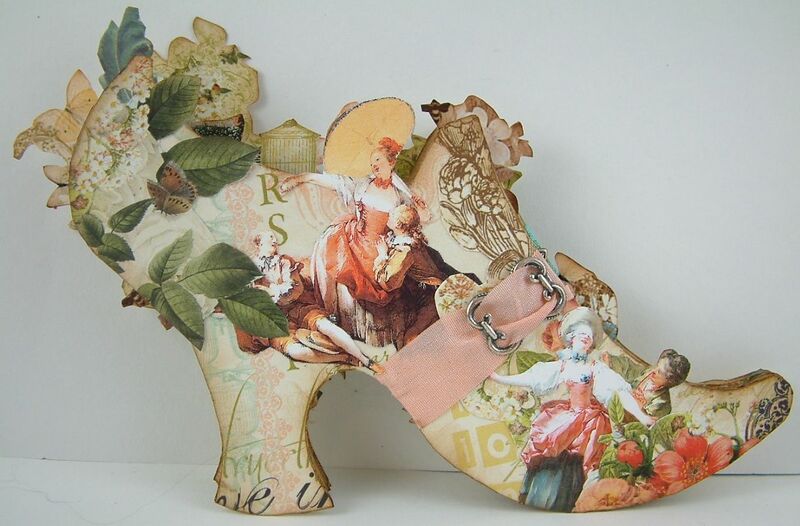 The front and back covers are made from the chipboard shoes. 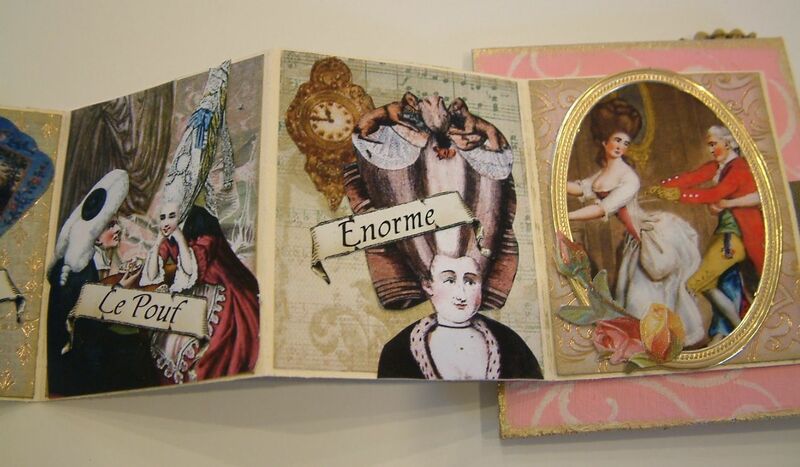 I used the chipboard as a template to create 4 cardstock pages for the inside of the book. I used a jump ring tied with ribbons to put the book together. Some of the images on each page stickup past the top of the shoe and when all the pages are stacked together you can see them peaking up behind the first page. 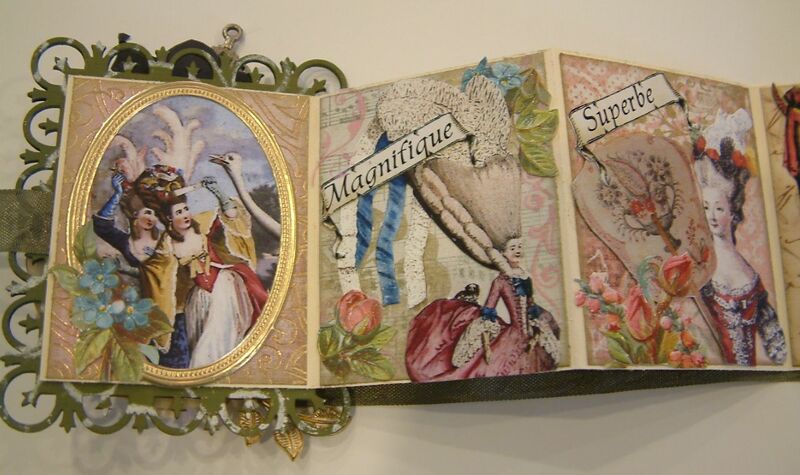 I used decorative paper, images from various collage sheets (see the list below), ribbon, buckles and ink to decorate each page. 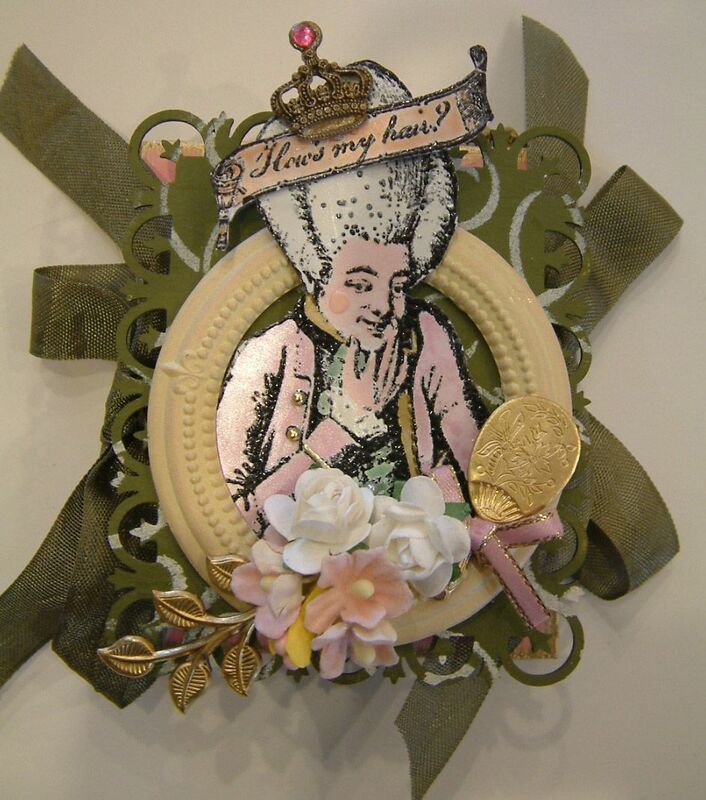 Alpha Stamps is also hosting a Marie Antoinette (Off with Her Shoes!) 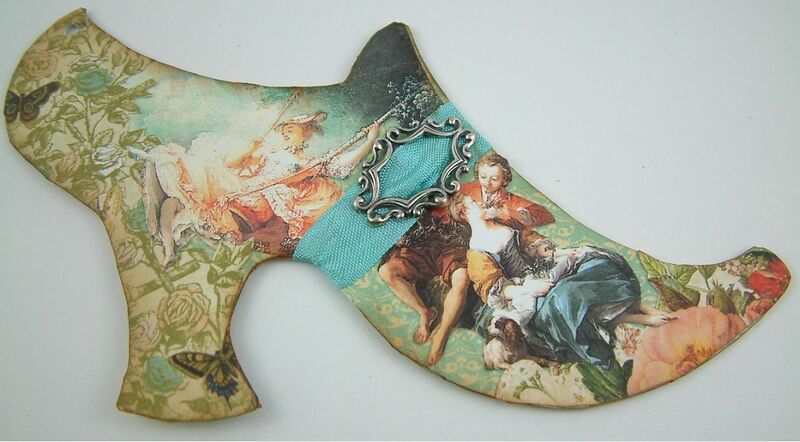 swap based on the chipboard shoe. If you are interested in joining the swap, click here for all the details. This bottle’s overall dimensions are 7 ½” x 3”. I used decorative beads for the feet. The gold on the top, neck and bottom of the bottle are metallic stickers. They come in all sorts of designs and sizes. I purchase mine at Frantic Stamper. 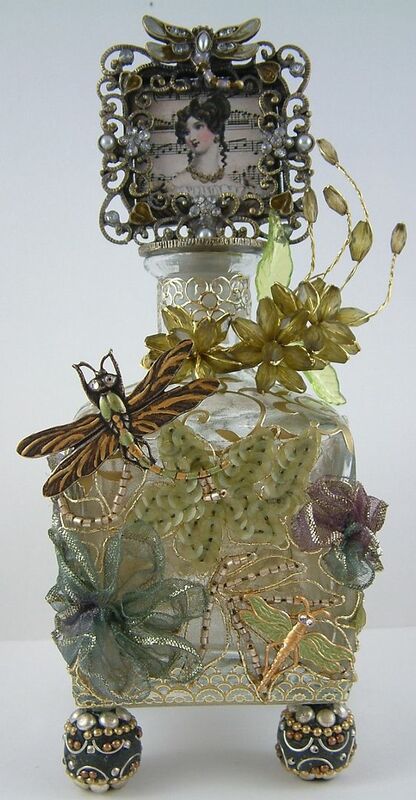 The bottle is wrapped in beaded and fabric flowers and leaves. 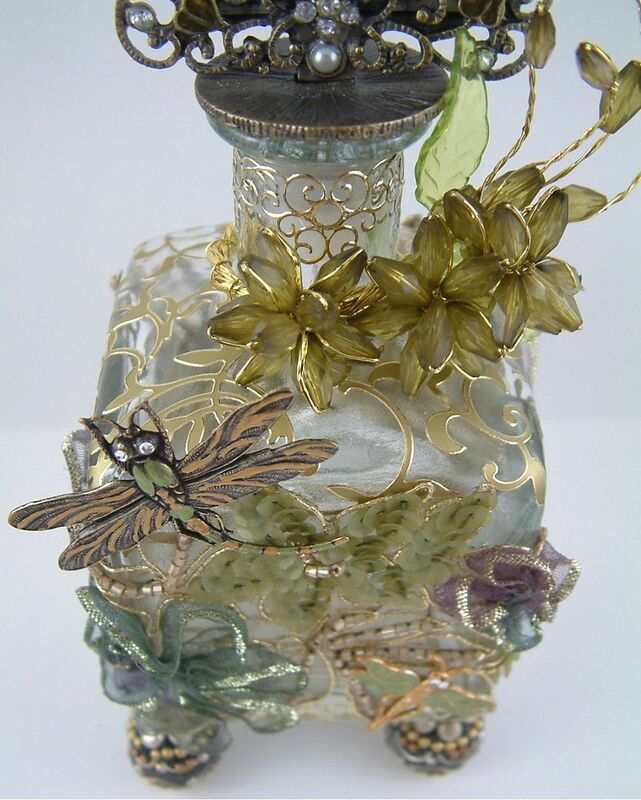 The neck of the bottle is wrapped in beaded flowers. The stopper is a picture frame. I painted the brass dragonflies (purchased at Alpha Stamps) on the front with metallic paints and added Swarovski crystals for the eyes. I used Glossy Accents to attach all of the elements. I have several more bottles siting on my worktable so stay tuned for more. Click here if you missed seeing my first altered bottle. I finished another of the dress form series I’ve been working on over the past few months. The bottom of the skirt is made from a fan turned upside down. I then backed it with lace and beaded trim. I used images of vintage jewelry, paper flowers and metal flowers to decorate the bottom of the skirt. The sleeves are images of jewelry to which I added Glossy Accents to create dimension. 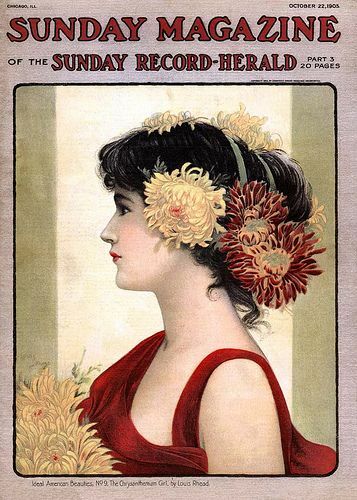 The overall size of the piece is 3” x 7 ½”. 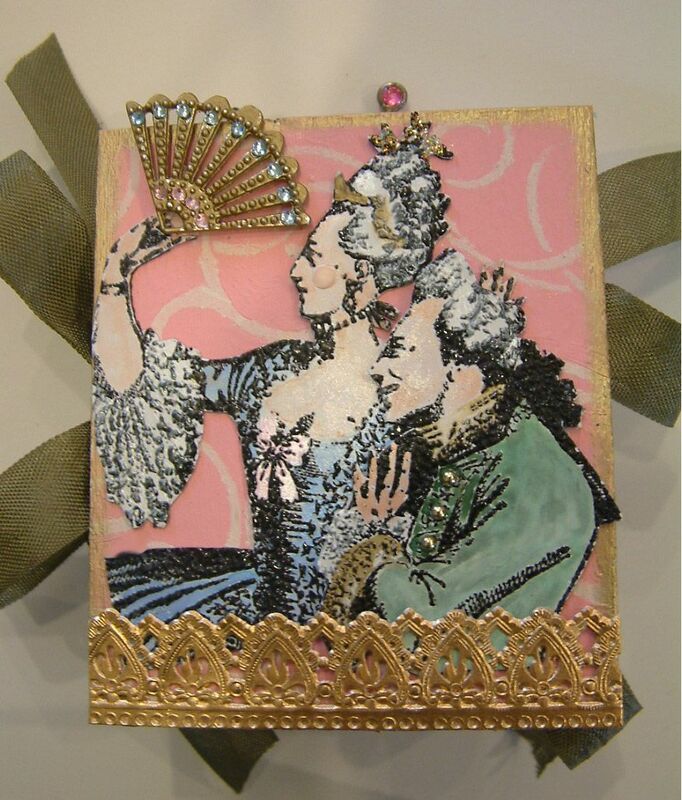 The background of this piece is brocade fabric that I attached to chipboard. There is so much gorgeous fabric particularly brocades, so if there is enough interest I’ll do a short tutorial on options for using fabric as a background. I painted the brass decorative piece at the top and at the bottom with metallic paints and alcohol inks. The pink roses were originally white. I used alcohol ink to paint them. If you touch just the edges of the petals the ink will soak slowly down the petal and you will get a gradation of color. This piece kicks off this month’s them of dance and entertainment. 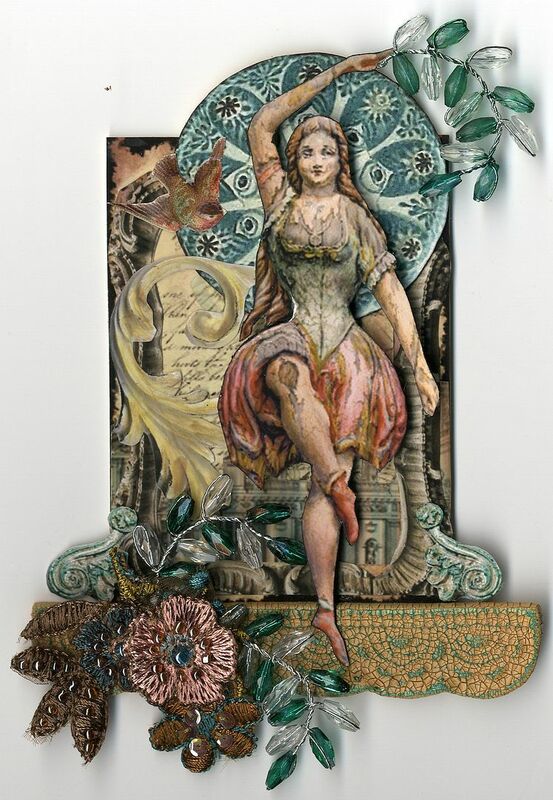 The border at the bottom of the piece is made from paper clay that I stamped, crackled with Ranger Distress Crackle Paint and then painted with acrylic paint. 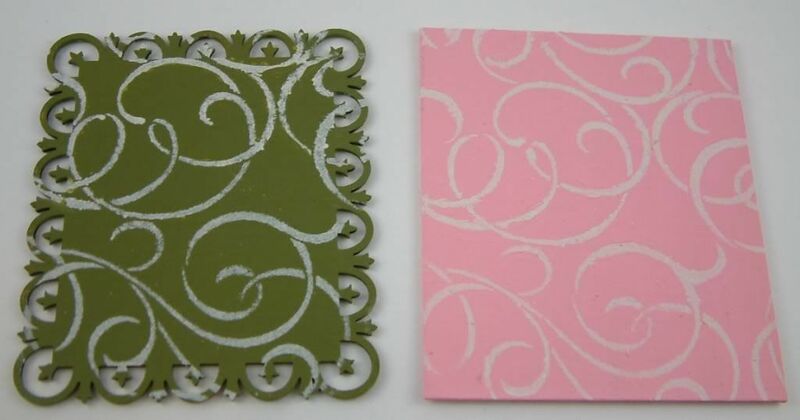 Click here to see the tutorial on “How to Stamp Paper Clay”.